Lauren & Dan got married on the 28th of July. 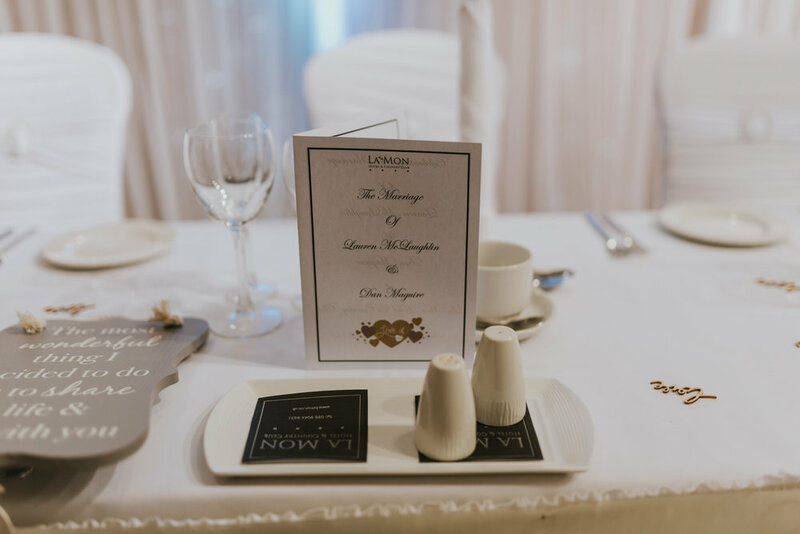 The ceremony took place in Hannahstown and the reception was at the La Mon Hotel. We where really excited for this wedding as we had our own wedding at La Mon and while we have visited many times since, this was the first time we have photographed a wedding there. Lauren got ready at her Mum & Dad’s home so we met up with her there on the morning of the wedding. Lauren and her bridesmaids had already been to the local hairdressers before we arrived so the morning seemed to go much quicker than normal. Once everyone was ready we made our way over to Hannahstown to meet up with Dan and his groomsmen. We had just got into our car when it started to rain and it wasn’t long before we actually had to stop the car as the rain was that heavy that we couldn’t see where we were going and we got absolutely soaked through in the 30 seconds it took to get from the car park to the chapel. The ceremony itself was lovely and there were a few giggles when a few people signed their name in the wrong place on the marriage certificate. Lauren and Dan had originally asked us to take some family photos outside the chapel after the ceremony but as there was some strong winds and it had started to rain again they decided to leave those until we got to the hotel. Getting to the hotel wasn’t as easy as we had expected as due to the heavy rain, quite a few roads where flooded. We have been so used to the amazing weather we have had this summer that I don’t think anyone was expecting the weather we had on the day. This could have easily made it a difficult day for Lauren and Dan, we have seen other couples before let poor weather stop them from enjoying their wedding. Not these two though, they where so excited to get married and Lauren herself said that nothing including the weather could spoil their big day. We would have been happy to work in the rain but understandably Lauren had some concerns about her dress so they decided to use the time we had set aside for photographs to spend some quality time with their family and friends. Before everyone went in for the speeches though we managed to grab a few photos of the bridal party in the hotel lobby. After the speeches and the wedding meal the rain had stopped so we where able to spend a few minutes out in the hotel grounds with Lauren & Dan before they made their way back into the hotel for the first dance. While there has been a lot of changes at La Mon since we got married there, walking around the hotel brought back a lot of happy memories from our own wedding.